My big plans for commuting by bike all through the winter have been dashed by the large amounts of snow and extreme cold. I haven’t felt comfortable sharing the shoulder of the old Cass Lake highway with the snowplows and I still haven’t figured out how to keep the feet warm below zero! I’ve taken comfort in superb cross-country skiing but today with its sunshine and balmy 35 degree temps I couldn’t resist getting out for a ride. Some of you have told me you want to see what I am riding for winter bikes. Here are my experiments. Last November I got a good deal on several used bikes made by Rans. 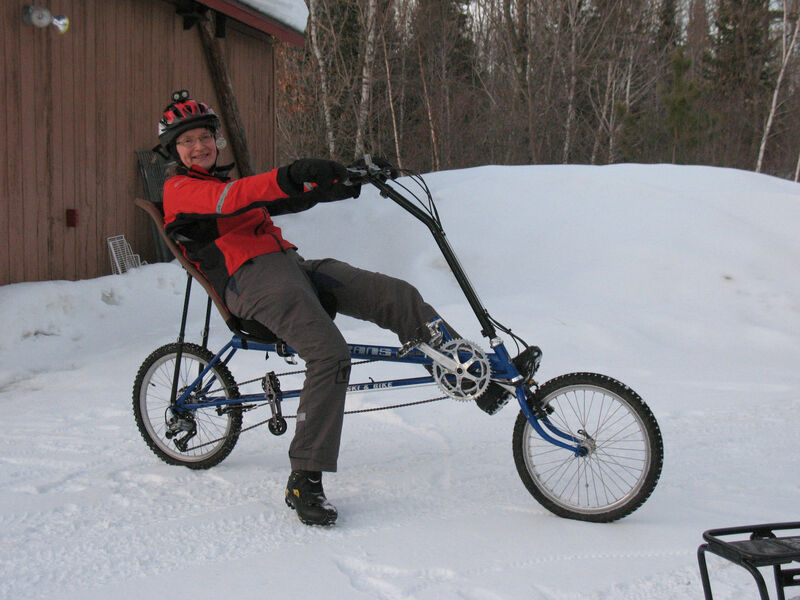 Rans is a small aircraft company based in the US that started making recumbent bikes long before they were popular. The bike I rode today is a Tailwind, a compact wheelbase recumbent with dual 20 inch wheels. I works well on the road but not in loose snow. Steering is a little twitchy with the far forward small wheel. The seat is very comfortable and if you do dump its not far to fall. 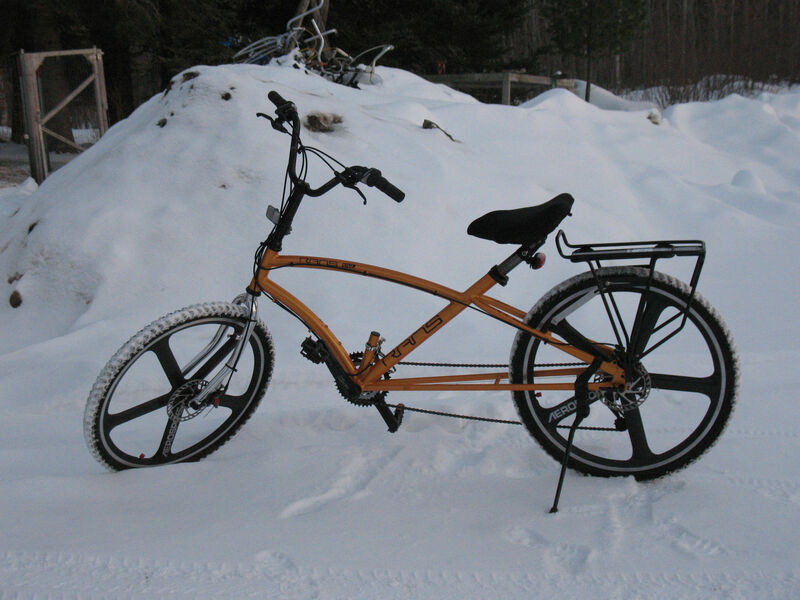 My other winter bike is the Rans Cruz, a “crank forward”. The geometry of this bike is stretched out so your feet are way out ahead of your hips. The seat is wide and comfy. One of the attractive features is you can sit fully on the seat and have both feet flat on the ground making it easier to recover from a slip or start up from a full stop even in slick conditions. With its 26 inch wheels this machine can plow through snow. Both the bikes have studded tires. As a person over 50 who knows what it feels like to break a bone I am wary of falling and really like the added security against slipping on unexpected ice. Yes, they make them for bikes, and no they are not illegal on the road. 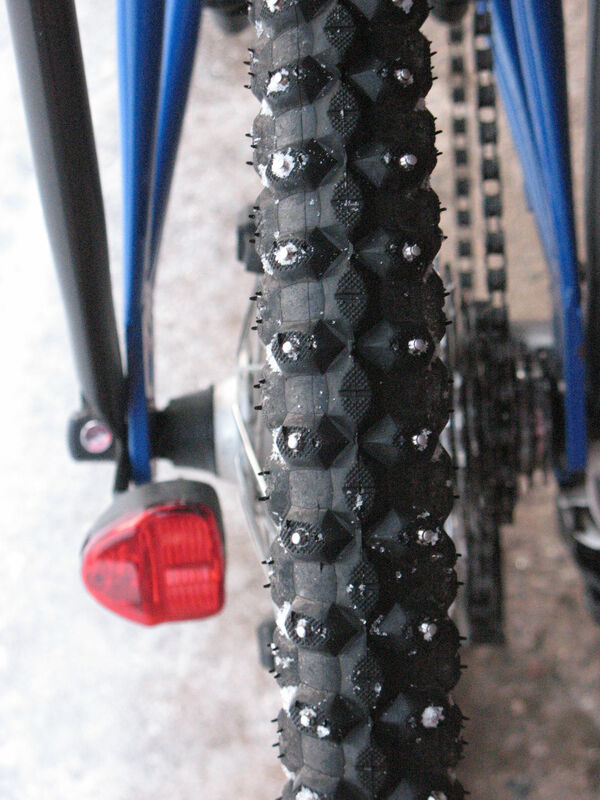 Studded tires for winter riding. Today’s ride was a pretty 12 mile jaunt on Sumac road. Whitetail deer, a piliated woodpecker, a couple of bald eagles checking out potential nesting sites, and the low sun taking its late afternoon golden turn. Incredulous looks from snowmobilers and SUV drivers. The wind in my face. Ahhhh. Forecast is for 30s all week Maybe I’ll get some commuting miles in after all!